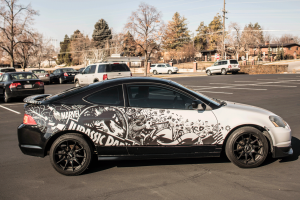 Arguably the coolest car on campus, Hawkes Poulter’s tricked-out Acura RSX is a homage to all his childhood loves, from Pikachu to Gandalf. 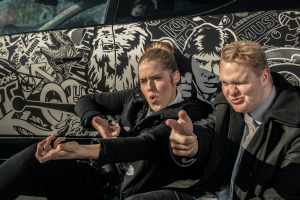 Siblings Hawkes and Normandy Poulter created the ultimate homage to their childhood by plastering Gandalf, Han Solo, and hundreds of other icons on Hawkes’s car. Photo by Bradley Slade. BYU freshman Hawkes T. Poulter (’22) has become accustomed to the roadside stares, the people taking pictures, the regular not-ticket notes left under the wiper. 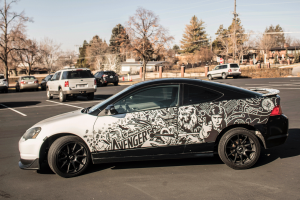 It’s the sort of attention that comes with driving a Poulter vehicle—in this case, Hawkes’s student ride, a thoroughly tattooed Acura RSX. A pre-animation student, Hawkes enlisted the help of his illustration-major sister, Normandy (’20), to trick out the RSX. She calls their creation “a visual conglomeration of our childhood nostalgias.” They incorporated band logos and comic strips and a fellow of the ring and a Wookiee and Pikachu and everything in between. “We went all out—no geekiness left behind,” she says. After designing and printing their wrap, Hawkes, Normandy, and a friend wielded heat guns, X-Acto knives, and burnishers to affix the artwork—with only a little help from Dad on tough spots, like that tricky spoiler. Hawkes’s ride has been a hit on campus and around town. He and Normandy got a laugh when their sister received a text from a friend who had snapped a blurry pic of “the coolest car” on the road. “You would have loved it,” she wrote. Sure enough, it was the Poulters’ work of art. Proposal of the decade goes to Y student Andrew Justvig, who shows anything can happen if you let it. BYU students flocked to the Harold B. Lee Library for the chance to hold a first-edition copy of the Book of Mormon. When it comes to campus parking, demand is high and supply is low. The result? A legacy of hilarious parking stories. Students once filled out tiny slips of paper to catch a ride home. No more.